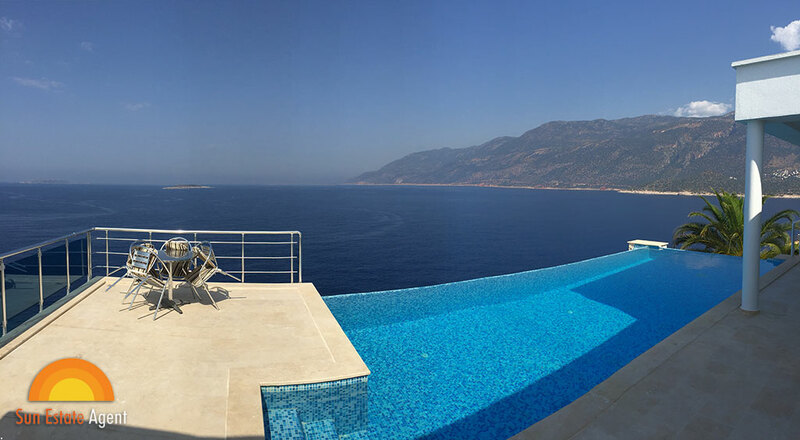 Villa Ayisigi (Moonlight) is an architect designed and supervised build in an exceptionally stunning location on the Cukubag Peninsula in Kas. 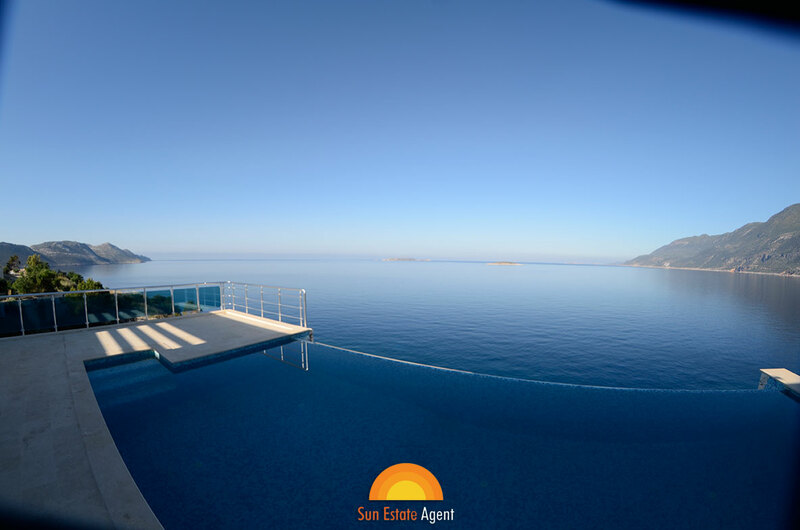 It is located at the very end of the peninsula giving the owner an uninterrupted 190 degree view of the Mediterranean Sea and the local Greek islands of Meis and Ro. 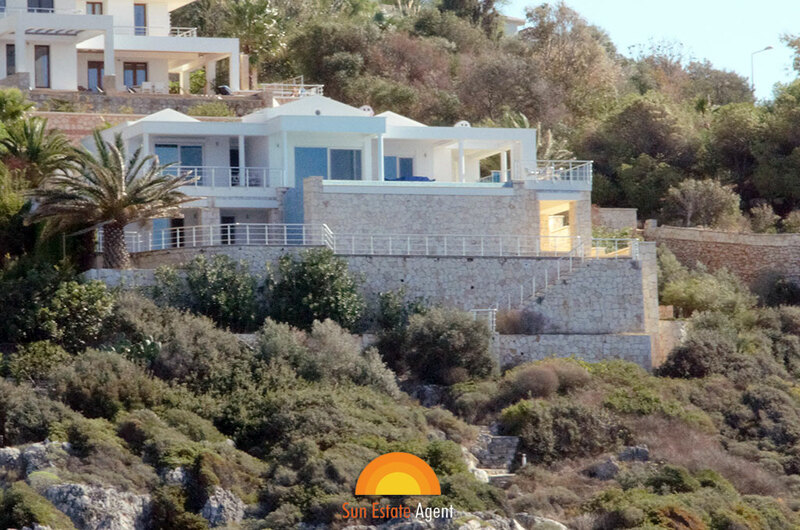 Villa Ayisigi is a front line villa, which has its own private beach accessed from the villa grounds and due to its stunning location enjoys beautiful sunsets every day of the year. 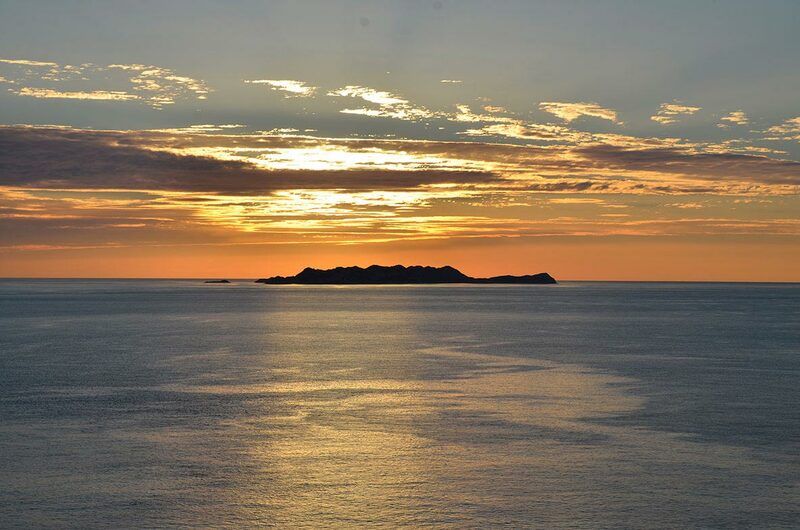 Perfect to sit with a sundowner and reflect on the day. 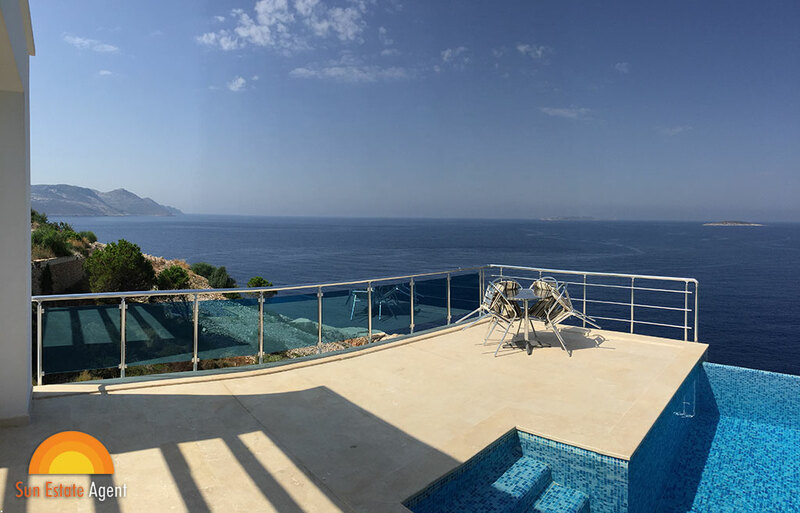 The villa has been featured in international magazines such as The Wall Street Journal, Place in the Sun and The Sunday Times as an example of the finest build quality and design available in Turkey. 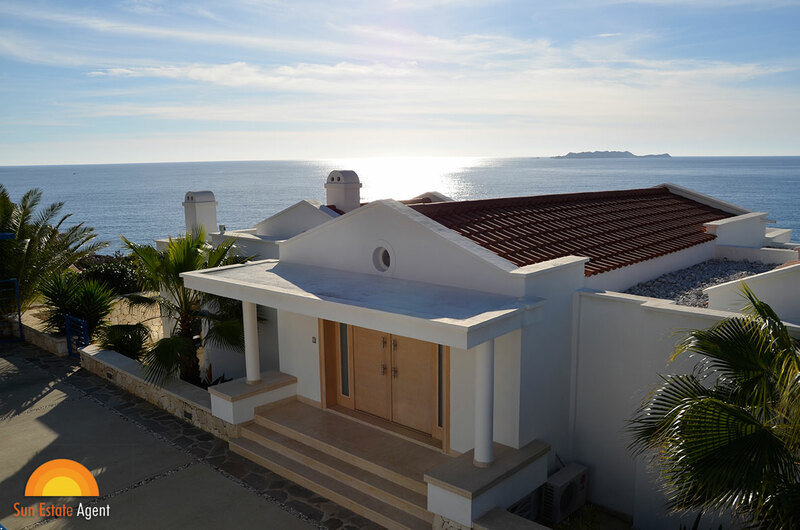 Access to the villa is via a set of bespoke double entrance doors that open onto a raised area with a sofa in situ. 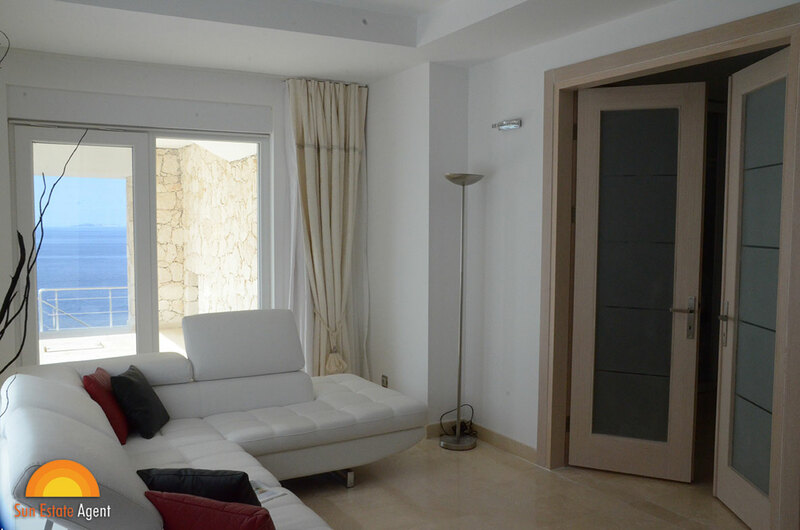 The individual design of the doors is carried throughout the whole property and are finished in bleached oak. 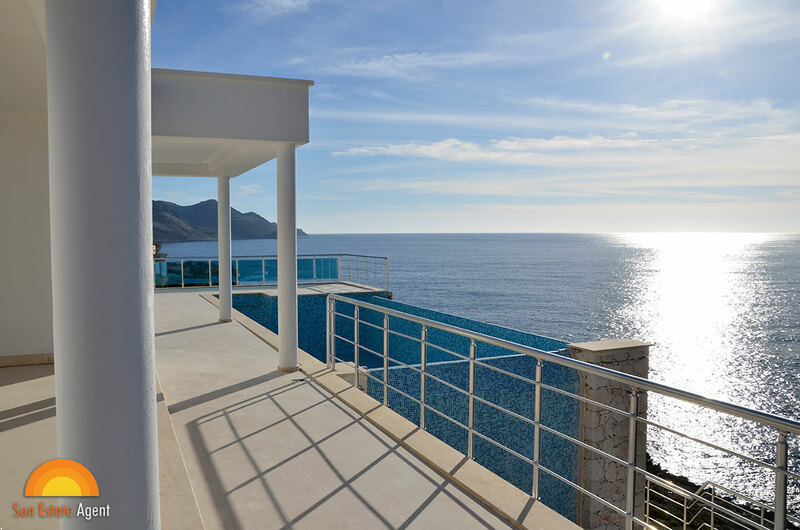 Upon entry, immeadiately your eyes are drawn to the magnificent views through the salon patio doors to the infinity edge pool and the sea beyond. The view is uninterupted and breathtaking. Decending five steps you enter the salon area leading to a dining area and a huge kitchen. 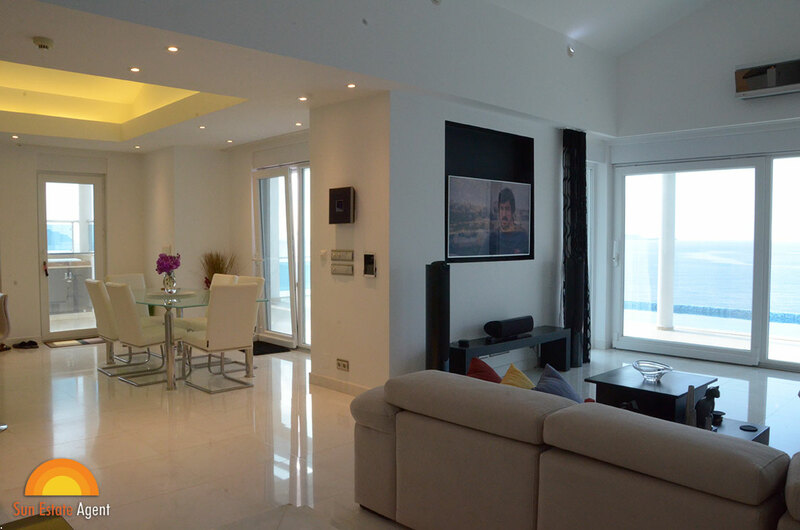 The whole floor is open plan and is finished in Afyon Sugar White Marble. The whole of this floor is heated by underfloor electric heating imported from Finland. The salon is furnished with a bespoke made sofa in a large curve facing onto a recessed large flat screen television. Here you can enjoy either satellite television, or IPTV from around the world, or access the BluRay DVD player. Linked to these pieces of equipment is a complete surround sound speaker system made by Bowers & Wilkins. The sound quality is breathtaking. To keep within the mandate of the keen lines there is no visible electronic equipment, except a small magic eye that operates all of the equipment stored in a seperate area. The dining table seats six in luxury whilst being adjacent to the central 3.3 metre island of the kitchen. 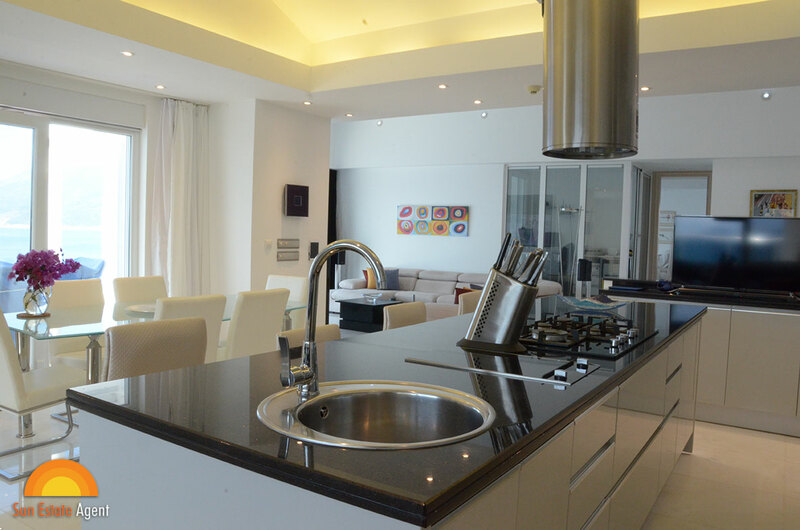 The kitchen was designed so the owners may interact with their guests whilst preparing drinks or food. Hidden lighting underneath the island enhances the ambience of the room along with recessed lighting above and LED dimmable downlighters. 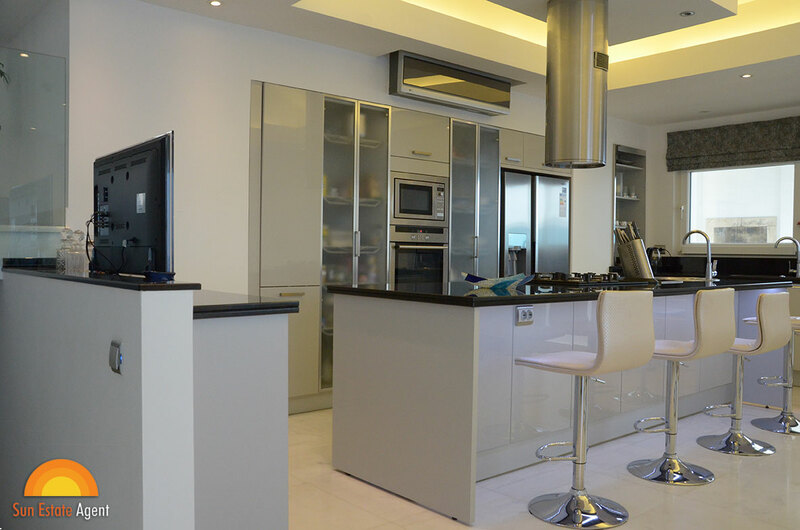 The kitchen is of Italian origin with a high gloss finish and' Star Galaxy' granite worktops. The appliances are Inox and the central island houses a five burner gas hob and a built in electric BBQ with a seperate sink for food preperation. There is a new Samsung 'Showcase' American Fridge/Freezer, wine fridge, dishwasher, Oven and combination microwave. Housed under the black granite style double sinks is the latest reverse osmosis water purifier system with additional filtration allowing the owners to drink the water direct from the special tap in the knowledge that ALL impurities have been removed. 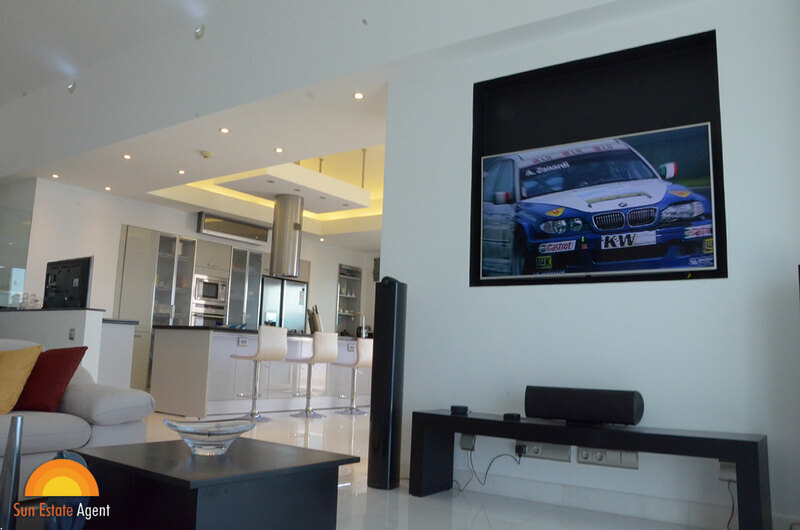 Entertainment in the kitchen area is supplied via a flat screen television with a soundbar and a special speaker mounted on the salon wall for music. This speaker utilises the network built into the fabric of Villa Ayisigi to access a NAS (Network Attached Storage) which stores over 55,000 tracks of music. This system is accessed by a dedicated iPad, or any smart phone with the appropriate app downloaded to it. Full control of this speaker and other speakers in the house is then under direct control of the user. Leading off of the salon is an office, with views out to sea, where the current owner has his computer and space for three screens. One of those screens is dedicated to the HD CCTV system and the camera images are displayed. The CCTV is recorded 24 hours a day and has the facility to re play or copy any incident that the owner wishes to keep. 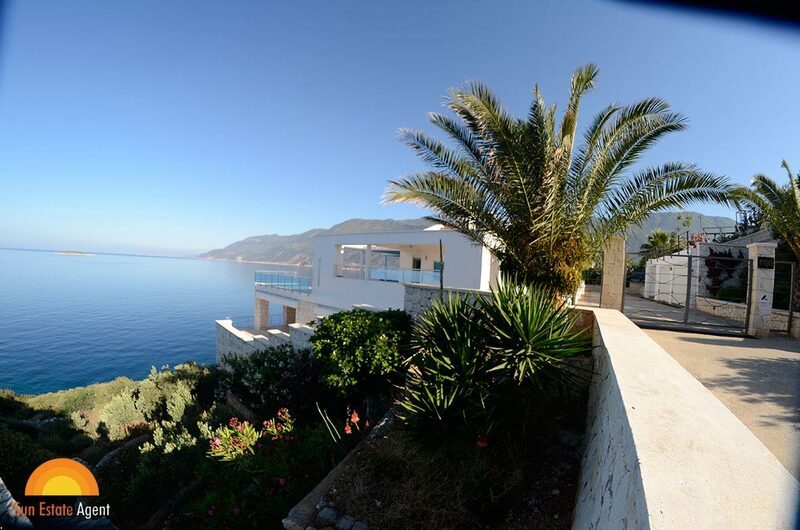 In can also be accessed via the internet so the owner may view the property in real time wherever they are in the world. The VDSL router is stored here and speeds up 36MBs are now possible due to the fibre optic infrastructure on the peninsula. The office has built in blinds in the glass and the door is lockable for security, if required. The room adjacent to the office/salon is the Master Suite. This has a bespoke island bed finished in Alcantara and all electrics are in the floor under the bed so there are no visible cables if the owner wishes to add further lighting, etc. The suite has a seperate shower finished in white marble with 'Zimbabwe Black' inset granite. The shower is a rain shower and supplementary body jets can be operated in addition to the main shower. There is a seperate toilet. Twin sinks with a a huge mirror behind and adjacent is a walk in dressing room. Recessed mood lighting enhances the ambience of the room. Patio doors give access to a completely private terrace. 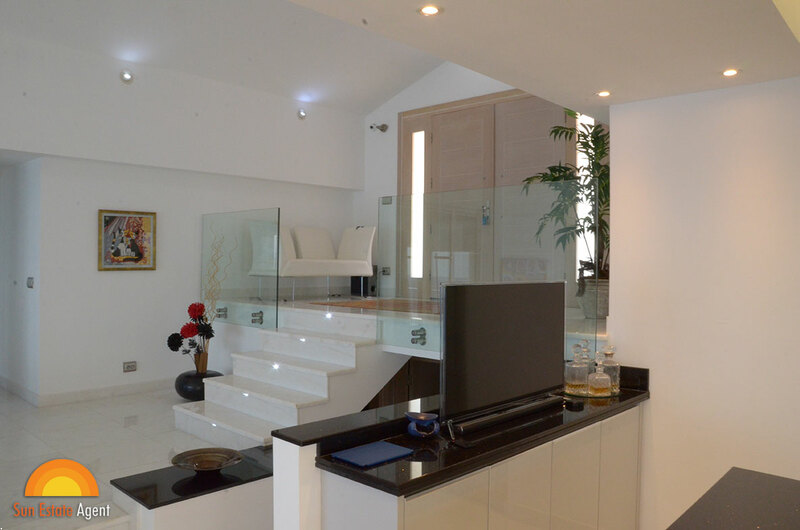 The lower level is accessed by stairs with recessed lighting built in. On a mid level is the day bathroom for guests, Japanese themed, with a seperate toilet to the main room. Also on that floor is the 'comms room' where all the electronics and electrics are routed to. There is also storage for guests coats, etc. On the lower level there is a fully equiped gymansium. 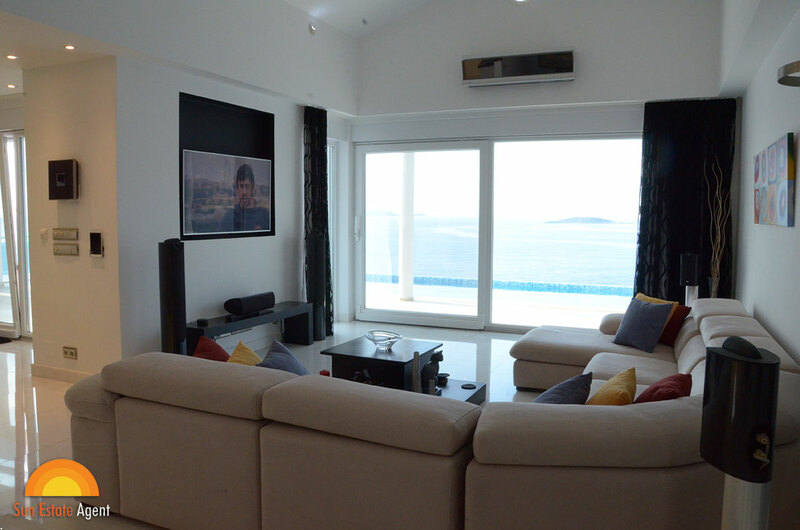 This has a large flat screen TV, speakers for music and the ability to listen to the music on the NAS via the app. 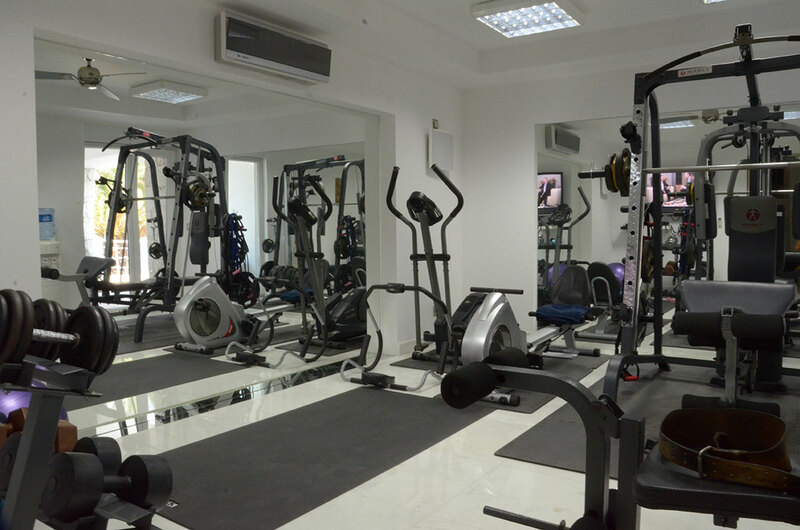 The sports equipment is varied and allows the owner to utilise both machines and free weights for both cardio and strength excercises. There is also a Wii for childrens and adults entertainment. 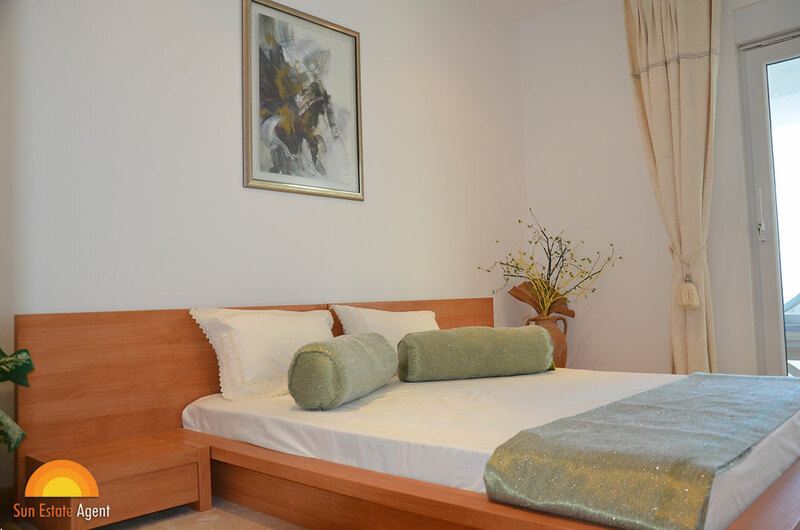 There are a further two double bedrooms, with access to a completely private terrace and the jacuzzi. There is a seperate bathroom with walk-in rain shower finished in 'Afyon Sugar' Marble with 'Guatemala Green' marble insets and a 'Guatemala Green' marble top with sink. At the other end of the house is a pool room with a bespoke slate bed pool table. Leading off of this is a seperate apartment area which has its own front door and can be accessed from the lower terrace. 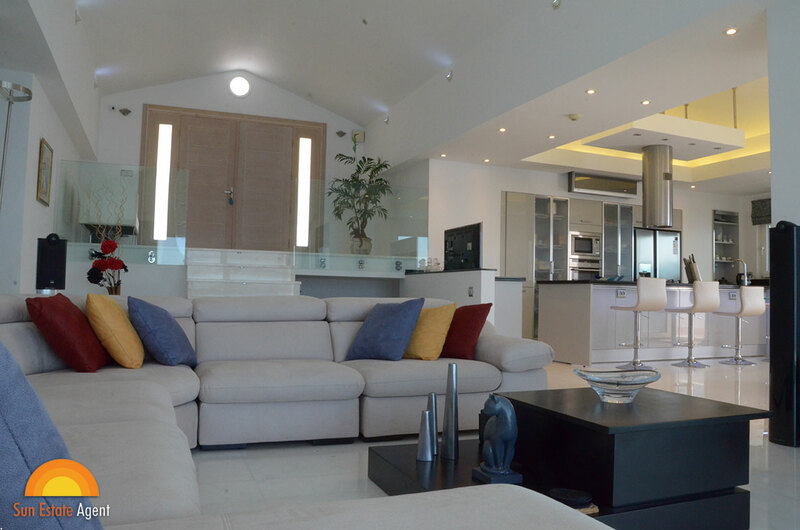 This apartment has a huge double bedroom, salon and a complete fitted kitchen. All bedrooms in the villa have air conditioning and additionally have American ceiling fans with variable speed control. On the upper level adjacent to the kitchen is an outside kitchen complete with gas hob, BBQ area and a built in smoker. There is electricity at the work surface. 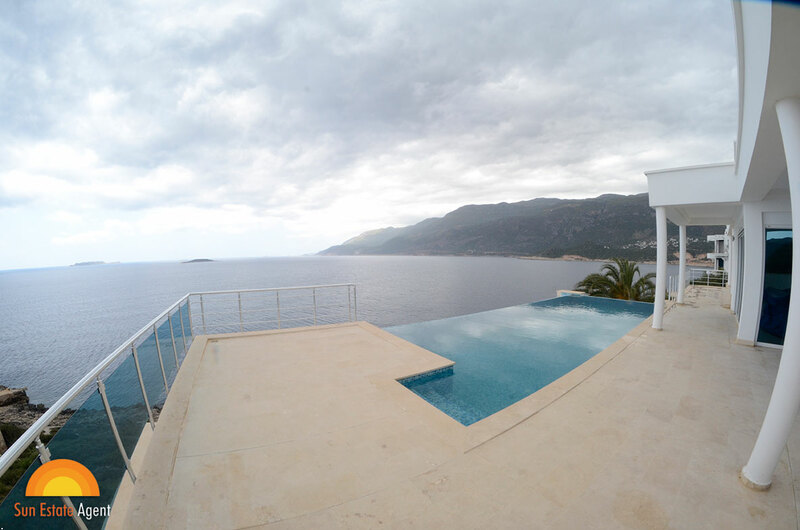 The pool is on this level allowing for entertaining and relaxing for all parties. There is an outdoor shower and room for two tables for entertaining and alfresco dining. LED wall lighting, LED's in the lower runway walkway, LED lighting to the large palm tree and lighting on the steps to the sea add to the outdoor ambience. All lighting, including the pool, is operated from a centrally located panel in the dining area in the house for ease of use.